Adapting a comic book character into a traditional novel format usually doesn't work out great. Visuals and splash panels are so important to the genre that inevitably something is lost in the transition. 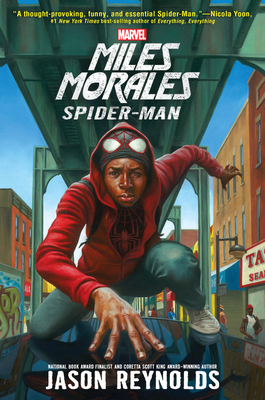 Jason Reynolds gets around that by mostly removing Spiderman from the story and focusing on Miles Morales, a half black and half Puerto Rican growing up in Brooklyn and trying to fit in in a school for rich kids where he doesn't feel he belongs. There are certainly very comic-booky elements to this novel (why wouldn't there be?) but Reynolds finds a way to tell a gripping and often moving way to tell Miles' story. This comic book character novelization manages to deal with institutional racism in a more honest and interesting manner than any "serious" novel I've read in a long time.